I recently finished reading Keigo Higashino’s The Devotion of Suspect X, a book I picked up by chance in London Luton Airport as I was trying to offload my last 10 pounds following my trip to the East Winds Festival and Symposium earlier this month. Truth be told, I rarely read modern fiction anymore and much less do I purchase physical paperbacks. However, as I browsed the WHS Smith, I didn’t find any classics so I resignedly drifted over to the general fiction section and after a thorough perusal of the shelves I elected to get Dance Dance Dance (1988), one of the few novels I hadn’t read from Haruki Murakami, one of my favorite authors, but as I made my way to the check-out a book buried deep in a display table caught my eye. I was immediately drawn to it and quickly changed my mind about Murakami. I didn’t know what it was but I later realized that I had come across its name in passing as it is happens to be an upcoming Korean film project, though I knew nothing beyond its title. I certainly wasn’t aware that it was based on this popular Japanese crime thriller. Not too long ago I read Natsuo Kirino’s Grotesque and Cut back to back and was quite taken with their effortless style chronicling extraordinary and often horrific events. 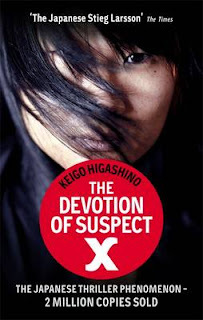 From its opening pages, The Devotion of Suspect X gripped me and turned out to be the very definition of a page-turner as I devoured it in two sittings. When I put down the book I was filled with a nervous energy and I’m sure its devastating ending will stay with me for a long time. Suddenly I’ve become terribly excited about the forthcoming Korean version of this 2005 novel, which was already made into a cult 2008 Japanese film. The premise, the characters, the atmosphere and the underlying themes make it a natural fit for Korean cinema and if done right it could well become one of the breakout hits of the year. “Yasuko lives a quiet life, a good mother to her only child. But when her ex-husband appears at her door without warning one evening, her comfortable world is shattered. 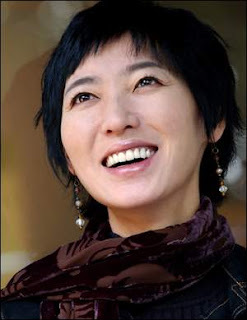 Though not referred to in the above synopsis, the principal character of the novel is actually Yasuko’s next-door neighbour Ishigami, a high school math teacher who sets in motion the extraordinary story. Before making the connection to the forthcoming Korean film, I was already picturing the burly and jovial Ko Chang-seok as this formidable and fascinating character. When I remembered the upcoming Korean film I hoped he was playing him, though it would have been a long shot as he is not a top leading man. Indeed that did turn out to be the case but I was no less excited by the actor selected in his place. Ryoo Seung-beom played the punk kid for years in Korea cinema (often in his brother Ryoo Seung-wan’s films) until he was finally cast in meatier roles in The Servant (2010) and The Unjust (2010) among others. Now he is one of the industry’s leading lights and at 31, he still has a lot ahead of him. He’s about 20 years younger than the character (who has been renamed to Suk-go for the Korean film) so it remains to be seen whether the teacher’s age will be changed or if Ryoo will be subjected to hours of makeup everyday like Jeong Jae-yeong and Park Hae-il were for the recent Moss (2010) and the upcoming Eungyo (2012). In any case I think Ryoo is a great choice and while he will certainly set himself apart from the protagonist presented in the book I think he has just the right combination of charisma, intelligence and paranoia to pull it off. Playing the role of Yasuko (renamed Hwa-sun) will be Lee Yo-won who most recently starred in The Recipe (2010) and the K-Drama 49 Days (2011). Her beauty and demureness should be advantageous for the role and though I am not overly familiar with her work she seems like a strong choice. Leading the whole affair will be Bang Eun-jin, who was primarily known as an actress before she turned to the director’s chair with Princess Aurora, one of the best genre efforts to come out in 2005. Her sophomore film is a much more ambitious affair but given the nature of her first outing and the way she handled herself, I am confident that she is the right person for the job. I think it’s fair to say that The Devotion of Suspect X (I imagine this title will subsequently change) is one of my most anticipated Korean films, not too far below Bong Joon-ho’s Snow Piercer (2013), Lee Hae-joon’s My Dictator (2013), Im Sang-soo’s The Taste of Money (2012) and Ryoo Seung-wan’s The Berlin File (2013). I hope this has whetted your appetite as well! While no release date has been confirmed as of this writing, filming, which began in December 2011, should be completed. I imagine the film is being prepped for an autumn or winter release. For more information on this and other films, visit MKC's Upcoming Releases page.